Our Campgrounds Near Indianapolis Are Just Right for Your Family! At Jellystone Park™ at Lake Monroe in Bloomington, IN. we believe in laughter, family fun and great camping! Whether you are staying with us for a weekend or vacation week, our campgrounds will amaze and revive you and your family. From accommodating cabins and great campsites to amazing amenities and daily activities in season, you will understand why our Jellystone Park at Lake Monroe is a total package of family enjoyment. Our campground near Indianapolis is located close by and brimming with fun things to do! Whether you are going to the Indy 500, Brickyard 400 and MotoGP or the Indy Air Show, your family will enjoy the splash park with multi-leveled kiddie slides, water spray features and a hydro storm tower that dumps water every few minutes to the delight of those below! There is also plenty of seating if you prefer to enjoy the sun and watch the kids play. Our park is also located close to the Children’s Museum, Lucas Oil Stadium, Indy Zoo and Indianapolis malls. Whether you are camping in an RV or under the stars we have the perfect camping spot for you. No matter the size or style of your RV, our park will accommodate your rig with full hookups, including water and sewer. Free Wi-Fi is included in our park for all guests and our resort-style amenities and activities are also included with your stay. This makes Jellystone Park one of the best campgrounds near Indianapolis for families. Many of our RV sites are situated around Yogi Bear’s Water Zone, our main attraction that will keep your entire family having fun. Please know that the best campsites always fill up first, so make your reservations today! At our campgrounds near Indianapolis, you will experience the peace and beauty that only sleeping under the stars can bring. Our beautiful wooded tent sites will help you to teach your children what camping is all about. Enjoy the night by a campfire and enjoy all the activities and amenities of Lake Monroe Jellystone Park during the day. All of our tent sites have a picnic table and fire ring making it so much easier and pleasurable to camp out under the stars. 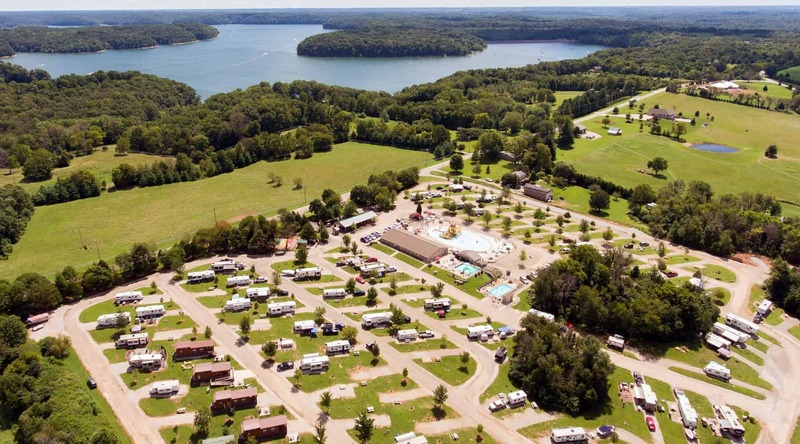 Jellystone Park™ at Lake Monroe also provides campsites and amenities that are perfect for any RV rally, camper rally, family reunion or group trip. Our facilities make it easy to spend time with old friends and make new ones. Our large pavilion with electricity can accommodate pot luck dinners, special events, and meetings. In addition, we have an indoor room that can accommodate smaller meetings. We also offer a special Rally Rate for groups who book 8 or more sites in the spring or fall. Lake Monroe has your camping spot ready for your family and friends. So, pack a tent and your supplies and head on down to the Jellystone Park™ at Lake Monroe and make some great new memories with your family and friends. Don’t wait another and reserve your spot at our amazing campgrounds near Indianapolis. Your whole family will enjoy great amenities, accommodations and of course Yogi Bear™ and friends!